From Niagara Falls, followed by stops in beautiful Ottawa, Québec City and Montréal, enjoy the unique East Coast of Canada on this 20 day luxury journey. After introducing the drama of Niagara Falls, followed by stops in beautiful Ottawa, Québec City and Montréal, this itinerary will present you with another side of Canada altogether – its unique east coast. The Gulf of Saint Lawrence is the largest estuary in the world, and a beautiful waterway to navigate, ushering you along a coast that is both wild and beyond easy categorisation. 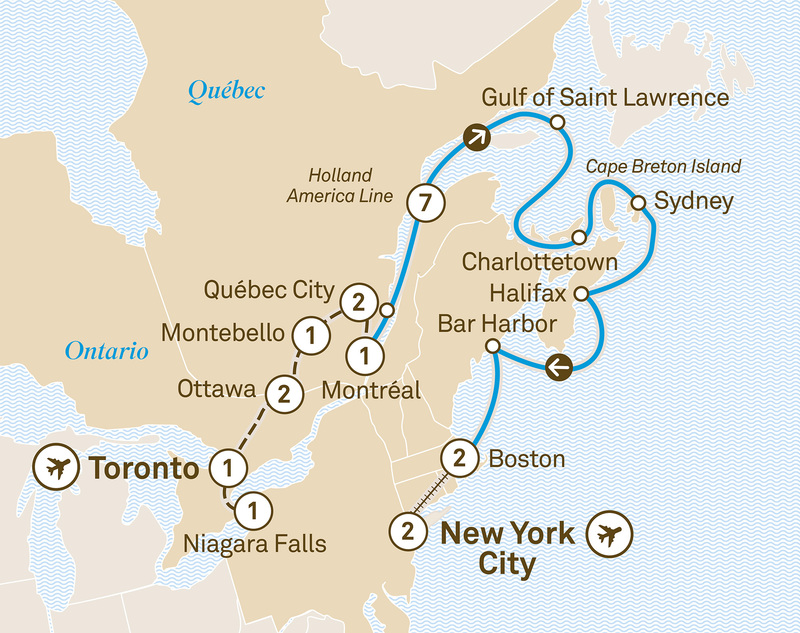 This is a part of Canada best enjoyed from the deck of a luxury cruise ship, and you can look ahead to incredible scenery, with stops in charming cities and splendid island ports, before concluding in cultivated Boston, and exciting New York City, the ‘Big Apple’. Welcome to eastern Canada. Your wonderful journey begins with an overnight stay at the Fairmont Royal York. This stunning hotel has counted royals, presidents and dignitaries alike among its guests, and today it will welcome you. Head to Niagara Falls stopping along the way at the wine region around Niagara-on-the-Lake, renowned for the production of ice wine. Later, feel the power of the Niagara Falls as you cruise to its base. Tonight, enjoy a ‘Welcome to Canada’ dinner. Overnight Special Stay at the Hilton Hotel & Suites Niagara Falls in a Fallsview room. Continue to Ottawa, Canada’s elegant capital city, for a two night stay at the Fairmont Château Laurier. Discover the charm of Canada’s capital on a guided tour. Nowhere is Canada’s bilingual culture more evident than in Ottawa. Freechoice: Tour Canada’s national museums, take a ByWard Market Culinary tour, or cruise along the Ottawa River. Choose between local restaurants or your hotel. Parc Oméga is home to bears, wolves, wapitis, red deer, beavers and more. View the wildlife as you journey through the 1,500 acre park. As you’ll discover, many of the animals certainly aren’t shy. Enjoy an exclusive overnight Special Stay in a rustic but elegant red cedar log cabin at Fairmont Le Château Montebello. Learn how maple syrup is made and dine on traditional Québécois fare at a local Sugar Shack while listening to live, local music. Discover the history of Québec City on a tour of the Old Town. Later, begin a two night Special Stay at the Fairmont Le Château Frontenac in the heart of Québec City. See Québec from the air by helicopter, or explore at ground-level on foot. Alternatively, sample local delicacies from artisans who have created a gourmet buzz in Québec. Today, it’s up to you. Visit the exquisite Notre-Dame Basilica, with its imposing Gothic Revival architecture. You’ll celebrate the conclusion of your Canadian jaunt at Fairmont The Queen Elizabeth with a sumptuous dinner. Board your luxurious Holland America Line cruise and settle into your Verandah Stateroom. Take the opportunity to further explore one of the world’s most beautiful cities. Cruise the mighty Gulf of Saint Lawrence. The world’s largest estuary flows all the way from the Great Lakes 1,200 kilometres away and has a coastal connection with half of Canada’s 10 provinces. Visit Charlottetown, the largest city on Prince Edward Island and the inspiration for ‘Anne of Green Gables’. The charming Victorian architecture, cobblestone streets and wild shores will inspire you as well. This extraordinary island is rich with Gaelic, Mi’kmaq and Acadian cultures. Explore the seaside capital of Nova Scotia. Maritime lovers will delight in the nautical-themed museums and the charming fishing village of Peggy’s Cove, complete with picturesque lighthouse on a rocky outcropping. Enter US waters as you arrive at Bar Harbor and prepare to be charmed by this truly quintessential New England coastal town. Explore the idyllic natural surrounds, including Mount Desert Island’s coast and Acadia National Park. Treat yourself to a taste of the famous New England lobster, followed by a scoop of homemade ice cream. Disembark your cruise and check into Fairmont Copley Plaza for your two night stay. Today, board a hop-on-hop-off bus in Boston and tour the sites that interest you most. Board Amtrak’s Acela Express and enjoy the superior comfort of Business Class. Arrive in New York City for a two night stay at the Renaissance New York Times Square. Fall in love with the ‘Big Apple’ as you explore the famous sites on a hop-on-hop-off bus. Tonight, enjoy a wonderful farewell dinner with your Tour Director and fellow travellers. No place exemplifies the magic of theatre more than Broadway and you’ll get the chance to enjoy a show in this entertainment mecca. Sadly your journey comes to an end today, but the wonderful memories won’t. Please note: Pre-release itinerary subject to change. From Toronto to Vancouver, embark on this incredible 30 day itinerary. Enjoy a Niagara Falls cruise, ride the Rocky Mountaineer & cruise the Inside Passage. From Toronto to Fairbanks, experience the best of Canada, Alaska & Arctic Circle over 35 days. Ride the Rocky Mountaineer and cruise the Inside Passage. From Toronto to Vancouver, enjoy a Niagara Falls cruise, before visiting Ottawa, Boston, New York and Vancouver over 41 days. Ride the Rocky Mountaineer.